Charming Beach One-Bdrm., Summertime, Summertime, sum sum now! Located at 739 Yarmouth Court in North Mission Beach, San Diego, CA, 92109, this is a Charming One-bedroom Condo on the ground floor with a kitchenette, a bath, a living room and an adjacent lush patio. The perfect economical alternative to a hotel stay for a couple or a small family, (with only one small quiet child). Only steps to the sand, (about 175 feet), on a quiet courtyard we're also just a short walk to restaurants, shops, and a myriad of outdoor activities. This is a non-smoking unit that sleeps two or two adults with a small child. A crib is availalbe. Please check the calendar for availability and then verify with me. I wanted a beach house in San Diego. Who doesn't? It was just a termite ridden shack when I bought it but I built it into something very nice. Come and enjoy! 90 degrees to the left and about 8 feet up. It's just 190 feet to the sand on the ocean side, (about a 20 second walk). It's also only 350 feet to the Bay. Available at a nominal charge. This is a charming ground floor one-bedroom with a brand new bed, a brand new down comforter, bed linens and a ceiling fan; a kitchenette with a granite countertop, fridge, micro, brand new gas stove, coffemaker, dishes/service for 4, etc.. The living room is furnished with hardwood floors, a new custom crafted entertainment center with a 27" flat-screen TV, a couch, coffee table and a ceiling fan. A large window (4'x5')opens to let you feel as though the outside and in blend. The bath is freshly painted and has a brand new ceramic shower! The patio has a table with a sun umbrella and four chairs and a gas grill - all beautifully surrounded by lush flowers and palms. NOW WITH WIRELESS DSL INTERNET ACCESS! ---And two beach cruiser bikes are available at $20-25/week each! Please contact me for availability. I do not maintain the calendar. This is a great location for proximity to the beach. It is perfect for a couple, everything that we needed - small kitchen, comfortable bed, wifi, small living room, outdoor table & chairs, beach chairs and towels. You don't need to rent a car - everything is walkable or call a car service if you are going farther out. Very close to beach. Owner is nice. Lives upstairs. I would definitely stay here again. Great place! Very reasonably priced. We enjoyed our short stay at David's place. We used his bikes and went all over the place. It was warm and comfortable and a pleasure to return to. Highly recommended! I could not have picked a better location. Steps from both the beach and bay. Dining, shopping and nightlife very close also. A charming rental. Thanks very much! Please come back soon. Cute little place. Getting hot water to the kitchenette was problematic. Really designed for you to eat out, though we prepared half our evening meals. Only table to eat at is outside. Place was reasonably clean on arrival, with the exception of top of cabinet. Considering what places go for, it was a fair price. There is no parking, except on the street. We typically had to park 3 blocks away. We found it quite, and it met our needs nicely. I asked Doug and his wife if he was happy with the place and if he needed anything a few times during his stay here. They both said everything was great, so I'm surprised at the somewhat tepid review here. The place was very clean when they got here. I know because I cleaned it myself including the top of the cabinet , (does this mean the countertop?). There is a table inside in front of the couch which most folks eat at, though there is no formal dining area, nor is there in most hotel rooms which I believe Doug is comparing my unit to. Additionally he stated the place is fairly priced but that is not accurate. It is a spectacular deal compared to the local hotels and, their rooms are much smaller and they don't have kitchens, private patios or grills. Please check with the Catamaran Resort or the Great Western Blue Sea Lodge for rates and you'll see how great a deal mine is. (They are both only about 300 yards away). There is nothing wrong with the hot water. I just tried it and, yes, you have to run the water for about 20 seconds for it to get from the hot water heater's tank, (about 12 feet away behind a couple walls), to the faucet but that's normal. Yes, parking is on-street as it clearly states in the listing. They told me they had a space close by, but the weather affects the parking greatly. When it's nice people go to the beach and the parking fills up. There's not much I can do there. There is paid parking available close by. I'm just a bit surprised and disappointed by their review. Being from Kansas City I'm sure they're used to lesser prices for hotels. A further bit of light was put on their review when I got an email from him, "It's unlikely we'll return to SD. It was fine, just not our cup of tea." I think that tells all. 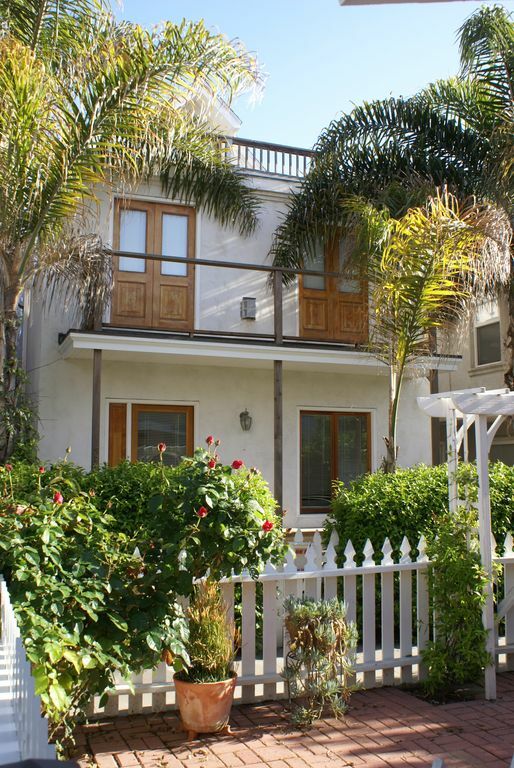 The place is a great deal, is very comfortable, and is only 200 feet to the sand. I'm sure you'll enjoy it here. Please come see for yourself! Very cute cottage for up to 2 - awesome location / great Beach / swimming etc. Host very professional and accommodating. Small kitchen with all you need to cook with your purchased groceries of course. Literally steps from beach and Mission Bay. Lots of great restaurants, coffee shops, beach shops and white sand/warm waters. I’ll be back for my beach fix again! Public parking nearby if you get a car (but car not really needed). Thanks Leslie. It was a pleasure having you & Joe here. Please come back soon. Everything you can think of for sports outdoors in the Summer! A 7 day pass for two to a nice local gym is included!!! Please contact me for availability. I do not maintain the calendar. Nightly Rate: $120 - $175 Weekly Rate: $750 - $1250 No cleaning fee if you leave the place as clean as you found it, (minus the linens which I launder at no charge). If not left clean then a minimum $75 charge will apply. If it takes over an hour to clean the rate charged will be $75/hour. Weekly Rate: $750 - $1250/week NOTE: Any and all credit card transaction fees are the responsibility of the renter. These fees will need to be reimbursed to the property owner. (The fees are customarily approx. 3% of the payments).